Mike Leake, fresh off the worries of being demoted to the minors for some up-start rookie, dominated the New York Mets last night, shutting them out for 7 innings, while allowing only 3 hits. The offense used a game plan that I think should be repeated in the future and scored all the runs the team needed in the first. Sure some of it was due to the Mets pretending to be the Cubs, but the results still had the Reds up 3-0 before any Met ever picked up a bat. The Reds have won the 3-game series against the Mets and are going for the sweep today. Despite it still being the Mets and the Reds sending out Mat Latos, the win will still be difficult. Yes, the Mets have one good starting pitcher who has almost 1/3 of the team’s wins in Matt Harvey. The Reds will see how good he is today at 1:10pm. 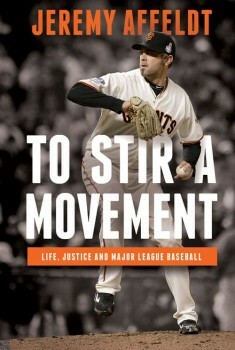 Jeremy Affeldt’s memoirs: To Stir a Movement: Life, Justice, and Major League Baseball. Jeremy Affeldt, a relief pitcher for the Reds in 2008, has released his memoirs in a book titled To Stir a Movement: Life, Justice, and Major League Baseball. In the book, Affeldt talks about overcoming his crippling fear or homosexuals. It sounds like Affeldt didn’t like the person he was and actively sought out the Bay area when he become a free agent after his year with Cincinnati. In his time with the Giants–this is his fifth year with them–he’s overcome his phobia and now admits he was wrong to judge like he did before. This is encouraging to hear from a baseball player. The response to the first openly gay NBA player was positive, and when a baseball player comes out, I’d love for it to not be a big deal. The progression of Affeldt’s judgmental conservative Christian beliefs to one of tolerance and acceptance is a good sign. With yesterday’s win, the Reds increased their road record to 12-12, the first time this season they’ve been at .500. The Reds’ offense was anemic yesterday, but it looked like their 2 runs would be enough until suddenly it wasn’t. Leading 2-0 going into the bottom of the eighth, Jonathan Broxton appeared to get shaken up by a rough defensive play that put a guy on first, and so promptly walked the next batter. Sean Marshall was the one to actually allow the inherited run to score, but even that didn’t seem so bad. After all, it would be Chapman in the ninth. Aroldis Chapman did come in in the ninth, but his recent struggled continued. He walked the first batter and then gave up back-to-back home runs to Erik Kratz and Freddy Galvis to blow the save and then the game. Coming into the month of May, Chapman’s ERA was 0.68. 20 days and 6 IP later, it’s 3.32. The 2-3 loss to the Phillies brings the Reds’ record to 26-18. Sounds pretty good, but it’s only good enough to tie with the Pirates for second. Tough division this year. The Reds visit the Mets tonight. Johnny Cueto (RHP, 1-0, 2.60 ERA) makes his triumphant return to the rotation and will face off against Shaun Marcum (RHP, 0-4, 6.75 ERA). First pitch at 7:10 p.m.
Cueto’s hokey-pokey-style turning himself around may soon be a thing of the past. Cueto has had success with a dynamic he added to his delivery a couple years ago: a turn to face almost the opposite direction as the batter before letting rip. But since then, he’s had a couple injuries that are suspiciously related to those turning-around muscles. He’s coming back from one of those tonight: while it was a lat strain that put him on the DL in the first place, it was that right oblique that kept him from coming off it in a timely manner. That’s the same injury that took him out of game 1 of the NLDS last year. If you don’t remember that, it’s because you blocked it out. You might want to seek out a support group or something. Point is, he’s considering changing up his delivery to protect that oblique muscle. It probably won’t be apparent tonight because you don’t just go around screwing with your mechanics on a day’s notice, but over time. Myself, I’m all for it. Even if phasing out that peek-a-boo turn makes him somewhat less ace-ish, any Cueto is better than no Cueto. Thanks in part to a 4-for-4 plus 2 walks performance on Saturday, Joey Votto has overtaken Shin-Soo Choo as the NL’s OBP leader. At .473 and .456 respectively, Votto and Choo outpace the rest of the league by at least .040 points. 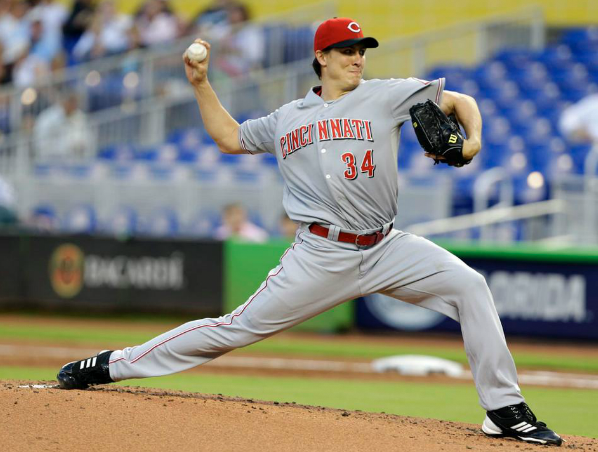 Homer Bailey recorded his first complete game yesterday. After a day off, the Reds opened their series in Miami against the second-worst team in the Majors in a big way. Brandon Phillips started the scoring in the first by singling in Joey Votto. Then in the second, the team exploded for a five-run inning–two of which came from bases loaded walks–to give starter Homer Bailey far more run support than he needed. Bailey was strong during his start, allowing two runs on just six hits, while walking out none and striking out 10. He notched the team’s first complete game of the season and captured just his second win. The Reds hope to continue their five game road winning streak against the Marlins when Mike Leake starts. Miami counters with Alex Sanabia. The first pitch is scheduled for 7:10pm. Chris Heisey, along with Johnny Cueto and Manny Parra, was on a rehab assignment in the Reds’ minor leagues. Unfortunately, he re-injured the right hamstring that he’s on the disabled list for. The 28-year-old was playing center field and batting second for the Blue Wahoos, but he never stepped in the batter’s box. Pensacola manager Delino DeShields pinch-hit for Heisey in the bottom of the first. 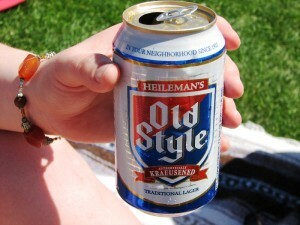 The outfielder was originally scheduled to play seven innings. This means we’ll continue to see more of Xavier Paul and Donald Lutz in left field. Considering how much better than Heisey both have been performing, that’s probably a good thing. Seven Cy Young winners started Major League baseball games yesterday. Barry Zito, Bartolo Colon, CC Sabathia, Jake Peavy, Felix Hernandez, R. A. Dickey, and Clayton Kershaw all pitched, with Sabathia and Hernandez facing each other. Posted in Cincinnati Reds, Daily Briefs, Game Wrap, NL Central. Donald Lutz got his first big league home run with some style yesterday. His 3-run dinger in the second inning put the Reds on the path for a 1-5 win and a series sweep of the Milwaukee Brewers. The win gave the Reds a 4-2 homestand and puts their record at 22-16. Even that is only good enough for second place in the NLC, though, where the Cardinals have 1 more win and 3 fewer losses. And it only puts the Reds half a game up on the Pirates. We knew the Central was going to be tougher this year with the departure of the Astros, but this is more contentious than I anticipated. The Reds have today off, which is good because they’ve still played more games than anyone else in the division. After today, though, the Cubs and Pirates should have caught up, while the Brewers and Cardinals will still have played a game fewer. Tomorrow the Reds go to visit the downtrodden Miami Marlins. The Marlins have half as many wins so far this season as the Reds, so it may be a good opportunity to put some distance between the good guys and everyone else. 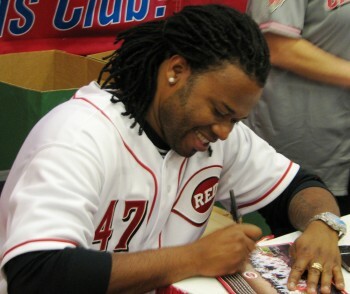 Cueto is soon to be off the bench and back on the mound if this rehab start goes well. Johnny Cueto pitched his first rehab start with the class-A Dayton Dragons on Thursday. He went 3.0 innings, allowing 1 run on 4 hits and 0 walks. He struck out 4. Now, you’d think an ace like Cueto wouldn’t be allowing runs to single-Aers, but I suppose that’s not really the point of a rehab start. He felt good enough that they’ve scheduled him a second trip to the mound in Dayton. Tomorrow he’ll again face West Michigan with the Dragons. As of this writing, there were 12 seats still available to choose through the Dragons’ website, so if you want to go, act fast. The Reds lead all of baseball in home wins. They are 16-6 when they play at home.